The relative success of the A.A. program seems to be due to the fact that an alcoholic who no longer drinks has an exceptional faculty for “reaching” and helping an uncontrolled drinker. The heart of the suggested program of personal recovery is contained in Twelve Steps describing the experience of the earliest members of the Society. The Twelve-Step process gives meaning to our lives. In working the steps, we come to accept both the dark and the bright sides of ourselves. We gain humility and perspective. In seeking to have our shortcomings removed, we develop a working appreciation of our own powerlessness and the strength provided by a Higher Power With our enhanced understanding of ourselves, we gain greater insight into and acceptance of others. In working the steps, they become a part of us—and we become a part of the life around us. Our world is no longer meaningless. We no longer fight the process. Today, in working the steps, we live it. 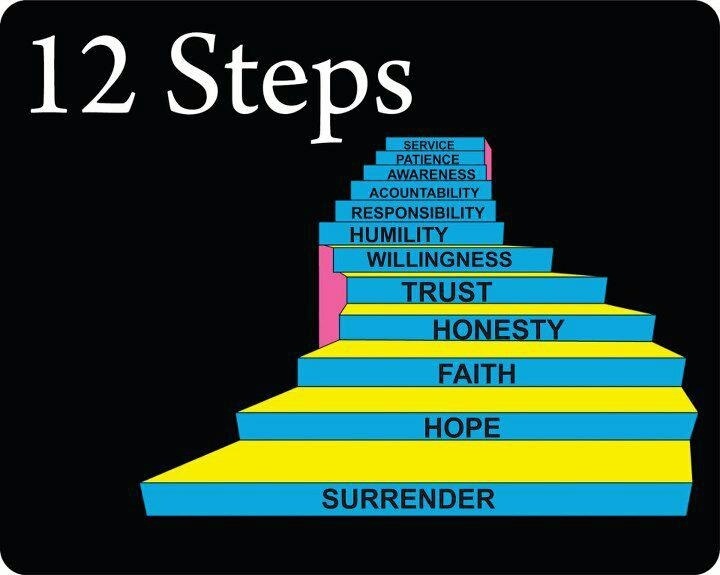 The five principles of the Twelve Step Program are; membership requirement, spiritual basis, personal inventory, restitution, and helping others. 1, We admitted we were powerless over alcohol – that our lives had become unmanageable. 2, Came to believe that a Power greater than ourselves could restore us to sanity. 3, Made a decision to turn our will and our lives over to the care of God as we understood Him. 4, Made a searching and fearless moral inventory of ourselves. 5, Admitted to God, to ourselves and to another human being the exact nature of our wrongs. 6, Were entirely ready to have God remove all these defects of character. 7, Humbly asked Him to remove our shortcomings. 10, Continued to take personal inventory and when we were wrong promptly admitted it. 11, Sought through prayer and meditation to improve our conscious contact with God as we understood Him, praying only for knowledge of His will for us and the power to carry that out. 12, Having had a spiritual awakening as the result of these steps, we tried to carry this message to alcoholics and to practice these principles in all our affairs. Newcomers are not asked to accept or follow these Twelve Steps in their entirety if they feel unwilling or unable to do so. They will usually be asked to keep an open mind, to attend meetings at which recovered alcoholics describe their personal experiences in achieving sobriety, and to read AA literature describing and interpreting the AA program.